It’s a Monday morning. We’re in the super elegant GÖNG Bar on the 52nd floor of The Shard, the highest hotel bar in Western Europe, complete with breath-taking views of London. And we’re surrounded by nine very excited and extremely nervous bartenders. It has to be a extraordinarily special occasion. It is, it’s the inaugural Italicus cocktail competition – The Art of Italicus Aperitivo Challenge. “Art is the inspiration for our competition because Italicus is inspired by art itself,” explains the brand’s founder Giuseppe Gallo, “even the bottle is inspired by the beautiful classic Roman column”. Which brings us back to why we find ourselves on the 52nd floor of The Shard. After everyone had torn themselves away from the spectacular London views it was time to get down some serious cocktail business. Sitting on the judging stools were internationally renowned bartender Alex Kratena, Hannah Grace Lodge of Bar Chick and The Cocktail Lovers. Louie Pollard, from Doctor Ink’s Curiosities in Devon, was first up. His Saturday Night At The Movies (Italicus – Rosolio Di Bergamotto, popcorn infused Monkey Shoulder Smokey, homemade cola syrup, Fee Brothers Black Walnut Bitters and lime) was, as the name suggests, all about the art of movies. Explaining that popcorn was an essential part of his visits to the movies he used it both as an infusion and an inspiration for the serving vessel. Jasmine Sumeray, East London Liquor Company, delivered the Meditative Rose (Italicus – Rosolio Di Bergamotto, pistachio infused vodka, elderflower cordial and citric acid) a drink inspired by the dreams of Salvador Dali. And Erion Bardhoci, Chiltern Firehouse, literally took his artistic inspiration from Italicus itself as he told the story of the liquid in his Bergamot Dew (Italicus – Rosolio Di Bergamotto,smoked mango, chamomile grappa and candied bergamot soda) where, for instance, he used yellow edible paint to represent the sun of Italy. Art for Claudio Furio, London Edition, was all about the epic poetry of Dante and was realised with his Bëatrice No 5 (Italicus – Rosolio Di Bergamotto, gentian and juniper, verjuce, split milk and barolo chinato) and in particular the red dress mentioned in the poem inspiring the striking colour of his drink. Eduard Balan, Aqua Shard, shared a memory of his childhood and how his mother had encouraged him to study literature with her unusual phrase “eating the books”. 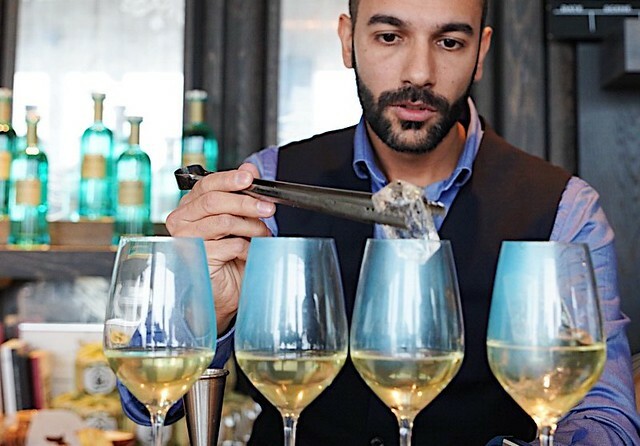 In homage to this he shared the details of his drink on an edible menu – the drink in question being Imperatoria Aperitif ( Italicus – Rosolio Di Bergamotto, olive grappa and white wine). Albert David, 18 Sky Bar, looked to the artistic influence of the Renaissance, interpreting it in The Golden Rebirth (Italicus – Rosolio Di Bergamotto, ginger wine, citrus mix, basil leaves and salty rose butter). There were three bartenders, though, that made it through to the final deliberations of the judges. Miriam Nini, Groucho Club, Alex Walker, Artesian, and Andrea Melis, Blue Bar at the Berkley. Miriam looked to an epic classic 2nd century story for her Cupid and Psyche (Italicus – Rosolio Di Bergamotto, Grappa di Prosecco, fresh lime juice, fresh pink grapefruit and Prossecco, with a garnish of green grapes). 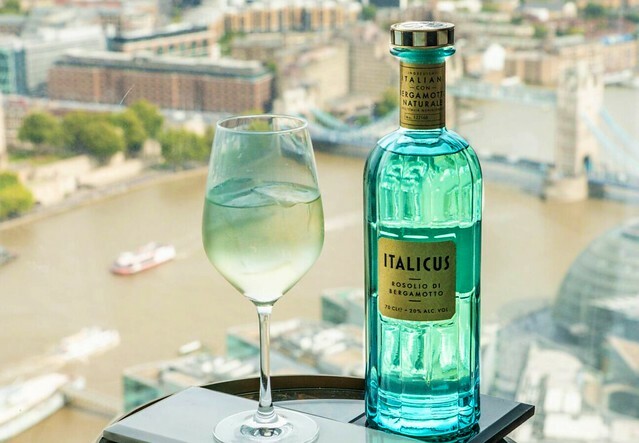 It was a clever presentation, likening the story and it classical origins to the design of the Italicus bottle, while the drink itself was elegantly presented in a wine goblet and beautifully balanced. Alex Walker loved the vibrancy of Van Gogh’s painting and reflected this in his Tournesol (Italicus – Rosolio Di Bergamotto, Sauternes 2015, Chartreuse, absinthe, soda and edible paint garnish). The serve itself was simple but finished with a flourish of edible blue paint on the glass to evoke the artist’s brushstrokes, while the drink was rich and satisfying. Andrea Melis related the story of the classic 1948 Italian film Bicycle Thieves and home it evoked the Italian character of Italicus with his drink The Stolen Bike (Italicus – Rosolio Di Bergamotto, Chardonnay white wine, coconut whey cordial, gentian bitters and soda, with edible paint garnish). Like Alex, Andrea also finished his drink with edible paint reprinting the colour of the Italicus bottle. As for the drink it was light and refreshing, full of flavour and beautifully showcased the Italicus. And it was Andrea that ultimately delivered the complete package in his presentation; story, product knowledge, passion and a super delicious cocktail. Andrea will be off to Milan in November for the global final , where he will join his fellow finalists from Croatia, France, Germany, Greece, Hungary, Italy, Netherlands, Scandinavia (Norway, Sweden, Denmark) and Spain. As Giuseppe said, The Art of Italicus Aperitivo Challenge is about celebrating the art of the bartender and bringing them together. When the bartenders gather in Milan it promises to be a very special celebration. Build first four ingredients over ice in a wine glass and top with soda. Garnish with a dusting of edible paint on the glass.